Vive la France! (or at least “vive” the bit of it that descended on Yorkshire last weekend). 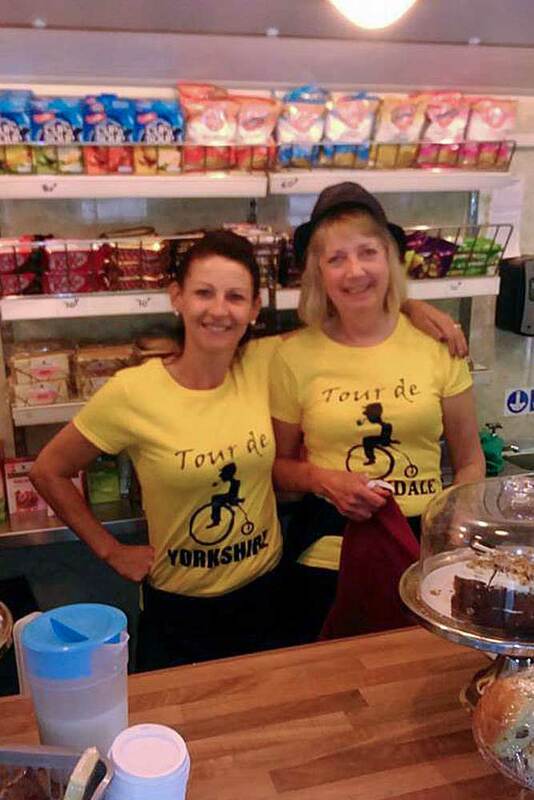 In unprecedented scenes, around 2.5 million visitors are estimated to have lined the route of the Le Yorkshire Grand Depart, as the cyclists raced from Leeds to Harrogate and then on day two (our day!) from York to Sheffield. The Railway was at the centre of a very stretched transport system as road closures and the party atmosphere meant that visitors wanted to – or in many cases had to – leave their cars at home. In response, we timetabled our most intensive service ever, with the first trains leaving Oxenhope at 0640 and Keighley at 0730, and the last round trip leaving Oxenhope over 12 hours later than the first departure in order to make sure that the revellers could all get back down the valley. We had two trains running all day, and thanks to auto-train operation (‘top and tailing’ the train with a steam loco at one end and diesel at the other) and the use of a third steam locomotive that could be serviced at Keighley after the departure of the train it had arrived on, we achieved a service every 35 minutes at the most intense periods of operation. With road closures starting around 6am (meaning that fireman Tom Kay having to employ all his youthful charm and wit to get past the barriers put up a bit earlier than expected on roads around Haworth! ), many volunteers had painfully early starts. I was based at Haworth station for the day, so was in the very fortunate position of being able to see City of Wells proudly displaying her Golden Arrow finery, basking in the sun in Haworth Yard. 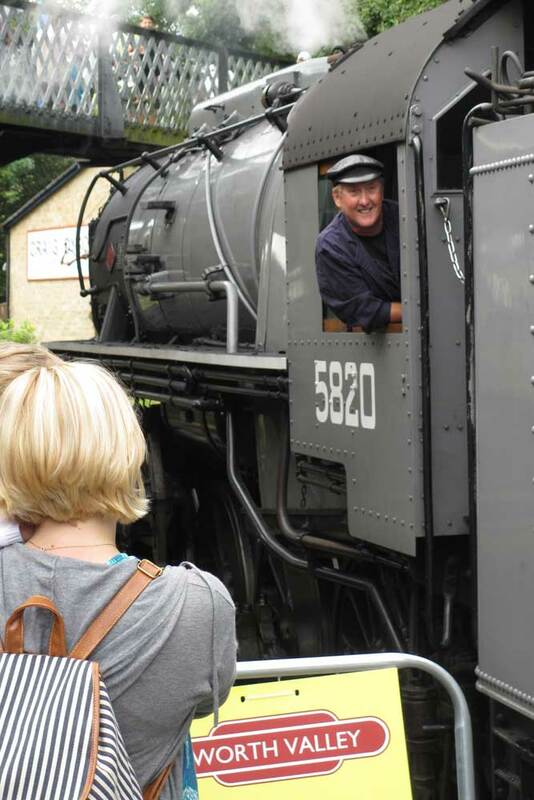 Her photo has been seen on the Railway’s Facebook page by over 4,100 people and has attracted over 300 “likes” and drawn similar levels of interest on the Railway’s Twitter account, showing the very immediate reach of social media. With that level of interest, we are very much looking forward to continuing the Anglo-French theme when City of Wells is back in service (dare I say it…) shortly?! For those of a different persuasion, you will be pleased to hear that the image of the class 25 on the first train of the day through Oakworth has so far managed a very, very respectable 200 Facebook “likes” of its own. Welcome to Yorkshire tried hard to get us in the commentary, which they achieved, but even they could not get the helicopter cameras to turn their cameras away from the attraction of the cyclists attacking Main Street and on to the Railway. We did get a passing shot of Damems, however (Nick Bennett, Damems signalman at the time, will provide an autograph on request). Whilst Northern Rail did not provide any additional early morning trains to Keighley, we still carried over 100 passengers on the earliest trains to Haworth and Oxenhope, and when the first Northern trains arrived from Leeds and Skipton waves of passengers descended on the booking office at Keighley. However, the months of planning really paid off as in a matter of minutes the team of summer employees acting as ‘roving ticket sellers’ at Keighley managed to sell tickets to over 500 passengers and disperse the queue, a process which drew compliments from visitors with many questioning why our friends on the ‘big Railway’ couldn’t devise a similar system to manage the crowds so effectively and efficiently. This team, made up mainly of our own home-grown younger volunteers, were quite simply magnificent in the way that they rose to the challenge and provided the response we needed to the biggest logistical challenge we faced. The operation of the Railway during the day was faultless despite the intensity of the service. Everyone was absolutely focused on the safe, but very prompt, despatch of trains, which meant that even at the height of the service we were never more than a couple of minutes adrift from the timetable (timetable stalwart Bill Black only recorded one two minute delay, he reported). The team of fire-fighters were kept busy as the loco’s were working hard to keep to time. Without their effort the service could have been severely disrupted (and the fire control centre called at one point to check that smoke from any fires would not affect the race itself). There was a fantastic atmosphere on the Railway, with both passengers and the volunteers revelling in the carnival atmosphere. The queuing and ticketing plans were effected efficiently and robustly, and we must draw lessons from the simplicity of the ticketing system for such an event that meant we could manage the peaks of demand, whilst ensuring that all passengers paid their way. The Railway looked spotless, despite the crowds, and seeing trains with standing room only was a sight to behold (and one that we are all very keen to find ways to repeat). Catering played their part, dealing with the problem of not knowing how many passengers would want refreshments and from when, meaning that some staff (Christine Laycock!) even chose to stay in the buffet for the night rather than risk being caught out by the road closures on the day. 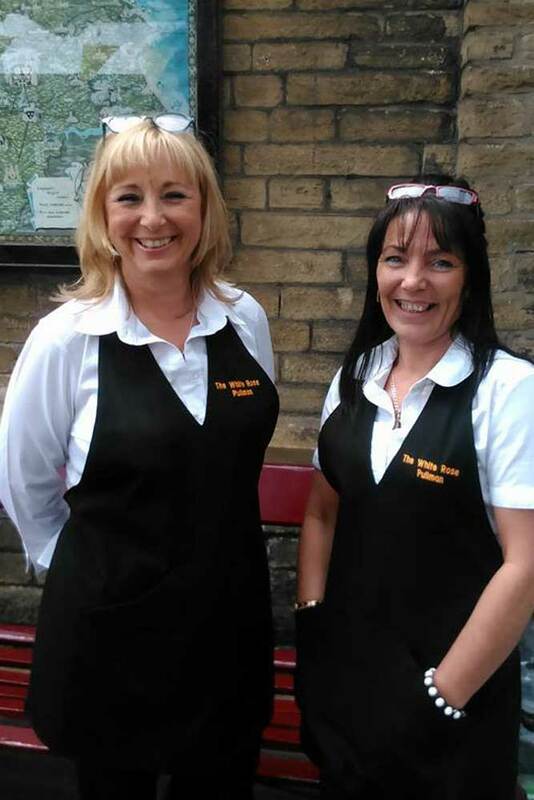 It was great being able to direct passengers to Jim, Christine Cashman and Janice’s tea stand at Haworth, and it was a reminder of the need to provide a hot drink for passengers as they await the next departure, especially on busier days. Every volunteer played a vital part, and whilst I wouldn’t usually want to single individual volunteers out, the magnificent planning was all down to Roger France’s leadership of our response to the challenge of what turned out to be the grandest of Le Grand Departs. Roger was supported by many including Noel Hartley and Sam MacDougall whose efforts were exemplified by the detail of the roster (with over 100 rostered staff on the day, plus many others in behind the scenes roles) and the content and complexity of the Special Traffic Notice. Whilst thanking them in particular on behalf of us all, special thanks are due to everyone who volunteered over the weekend, from the loco crews and operating staff working tirelessly to keep us on time; to the station staff dealing with very full trains, but keeping passengers in good spirit; to those involved in catering for thirsty and hungry visitors; to those helping to keep the Railway looking so good despite the number of passengers; and to all the others doing their very important bit to support the event. The sum of everyone’s efforts showed the Railway at its absolute best. Thank you. it never entered my head that our wonderful railway wouldn’t rise to the challenge! Sadly, I never got a look at any of the trains as I was busy all day helping Haworth Cricket Club cater to the many visitors you had brought up the line! My only disappointment was watching the recording later that evening as we so wanted to see a steamer chuffing up from Damems as the race toiled up the A629! That would have been amazing! 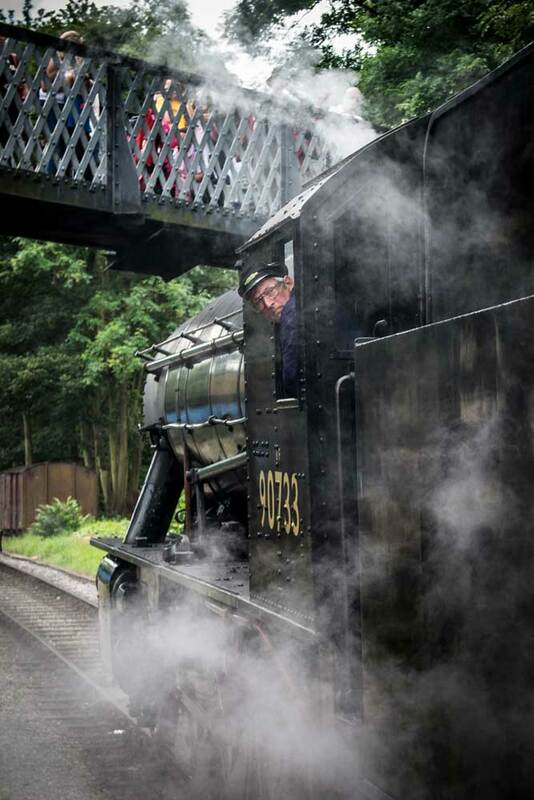 Fantastically well done to all of you from a steam-mad family of KWVR life-members! I don’t think anybody who was helping throughout the Valley saw much more than what was immediately in front of them. A great team effort everywhere and a great atmosphere.